May I present for your my vision of the Harlequins in 40k. This is something I have been working on for a while, but it is not well play-tested. Points values may need tweaking, so I would greatly appreciate any feedback that you have. Requires Codex: Eldar and Codex: Dark Eldar. Rules for Warp Portals and Shadow Fields taken from Codex: Dark Eldar. Rules for Hallucinogenic Grenades taken from Codex: Grey Knights. 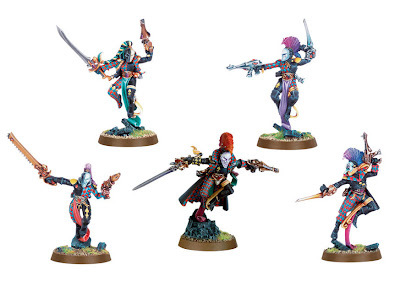 The mysterious Harlequins live within the webway, sworn guardians of the Black Library. The may emerge at any time or place to perform, or wage war, with exquisite grace. Flip Belt: See the rule in the Harlequin section of Codex: Eldar or Codex: Dark Eldar. Holo suits: See the rule in the Harlequin section of Codex: Eldar or Codex: Dark Eldar. Domino Field: This field improves the light bending properties of the Harlequin holosuit. It confers a 3+ invulnerable save to the model. Shadow Field: This energy field can remove the wearer from reality, making them virtually impossible to kill. However if the field is pierced the generator stops working leaving the wearer vulnerable. 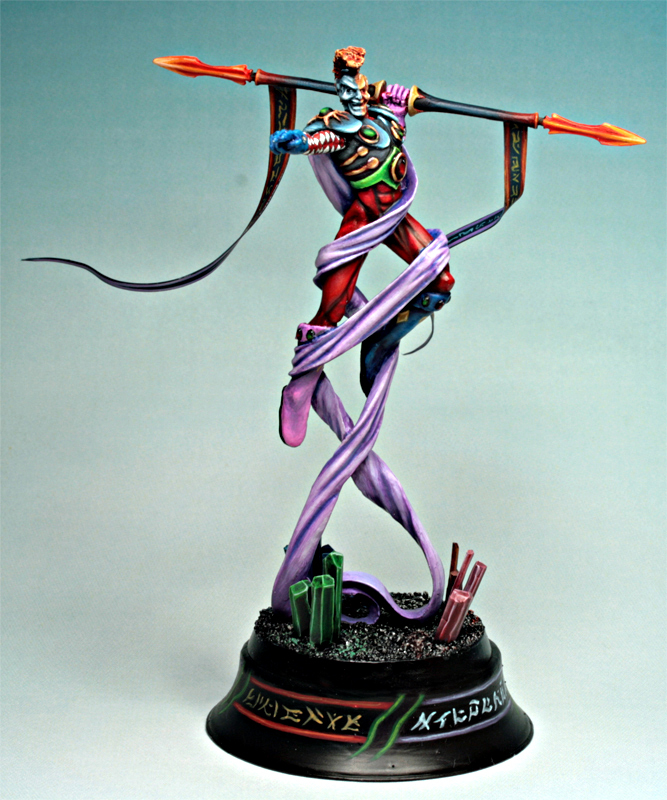 See the rule in the Harlequin section of Codex: Dark Eldar. Riveblades: These paired power weapons strap to the outside of the wielders arms. They count as two power swords in close combat, and provide +1 A in addition to the usual bonus for wielding multiple close combat weapons. Shrieker Cannon: See the rule in the Harlequin section of Codex: Eldar or Codex: Dark Eldar. Webway Portal: See the rules from Codex: Dark Eldar. Eldar Jetbike: See the rule in the Wargear section of Codex: Eldar. Mask of the Seer: Counts as a Ghost Helm. See the rule in the Farseer section of Codex: Eldar. Each model must make an initiative test or its attacks are instead targeted against their own unit, exactly as if they were fighting on your side! Re-roll for single model units. Straight Through the Hatch: Harlequins are adept at placing grenades on moving vehicles. They count the vehicles speed as one category lower than normal. Against walkers in close combat they hit with a grenade on a 4+. Dance of Death: See the rule in the Harlequin section of Codex: Eldar or Codex: Dark Eldar. Dance of the Refrain: Mimes are particularly difficult to pin down in close combat. They are always hit on a 5+ in assault. If the opposing model already always hits on a specific value, roll off to determine which score is used for the entire unit in this turn of combat. Master Strategist: See the rule in the Autarch section of Codex: Eldar. Leader of the Troupe: Armies lead by a Great Harlequin can take Harlequin squads as a Troop choice. 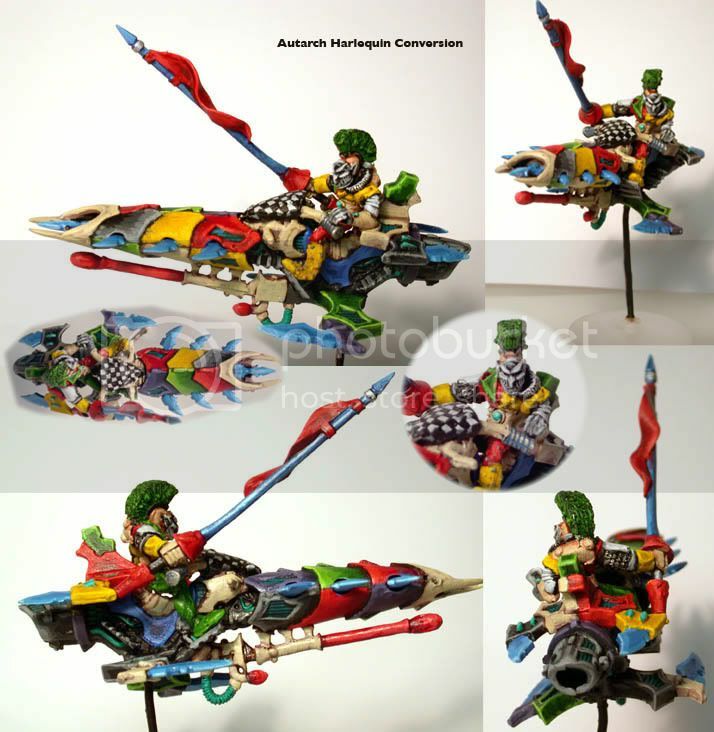 If the Great Harlequin is mounted on a jetbike the Harlequin Jetbike units of at least five models can also be taken as Troops. Dance of Rapturous Slaughter: The Solitaire can choose to enter play via deep strike. If he does so he may placed anywhere without scatter, and may make an assault move on the same turn. In addition, the Solitaire may use a consolidation move to move directly into assault with another enemy unit, if they are within range. Death Without Warning: A force guided by a Master Mime always strikes with precision. You may re-roll the roll to determine who chooses to go first. In addition, if you win the roll and choose to take the first turn, the rate of fire of all guns wielded by infantry models increases by +1 in the first turn of the game. Suspensors: These anti-gravity devices considerable reduce the weight of whatever they are attached to. Models with suspensors may fire a heavy weapon after moving in the same turn. They may not however assault in the same turn. Veil of Tears: See the rule in the Harlequin section of Codex: Eldar or Codex: Dark Eldar. However in this Codex the effect applies to all units within 6" of the Shadowseer model, whether or not he has joined the unit. Misdirection: The Shadowseer reaches into the mind of his enemies, seeding confusion and doubt. Cast in the enemies assault phase, it forces all enemy units wishing to assault the Shadowseer's unit to take a Leadership test on 3D6. The unit must pass this test in order to declare the assault. Wargear: Shuriken pistol, close combat weapon, flip belt, holo-suit (5+ invulnerable save), plasma grenades, haywire grenades. Special Rules: Dance of Death, Fleet of Foot, Master Strategist, Leader of the Troupe. He may replace the shuriken pistol with a fusion pistol for 10 pts. He may replace the close combat weapon with a Harlequin's Kiss for 5 pts, or a power weapon for 15 pts. He may replace the shuriken pistol and close combat weapon with a pair of Riveblades for 20 pts. He may ride an Eldar jetbike for 30 pts. He may take a Webway Portal for 35 pts. He may take a domino field for 20 pts, or a shadow field for 30 pts. Options: He may ride an Eldar jetbike for 30 pts. He may take haywire grenades for 5 pts. He must purchase at least one of the following psychic powers: Misdirection for 20 pts, Veil of Tears for 30 pts, Eldritch Storm for 20 pts, and Mind War for 20 pts. He may take any of the following: spirit stones for 20 pts, creidan grenade launcher for 20 pts. Wargear: Shuriken pistol, close combat weapon, sniper rifle, flip belt, holo-suit (5+ invulnerable save), plasma grenades, haywire grenades. Special Rules: Dance of The Refrain, Fleet of Foot, Infiltrate, Stealth, Death Without Warning. Wargear: Shuriken pistol, close combat weapon, plasma grenades, flip belt, holo-suit (5+ invulnerable save). Special Rules: Fleet of Foot, Dance of Death, Straight Through the Hatch. The entire squad may purchase Haywire grenades for 3 pts / model. Up to two models may replace their shuriken pistol with a fusion pistol for 10 pts each. Any model may replace its close combat weapon with a Harlequin's Kiss for 4 pts. One Harlequin may be upgraded to a Troupe Master for 20 pts, replacing his close combat weapon with a power sword or Harlequin's Kiss for free. A squad of 5 models may take a Venom as their dedicated transport. Special Rules: Dance of Death, Fleet of Foot, Fearless, Eternal Warrior, Straight Through the Hatch, Dance of Rapturous Slaughter. Special Rules: Fleet of Foot, Scout, Infiltrate, Stealth, Dance of the Refrain, Straight Through the Hatch. Any model may replace its shuriken pistol with an Eldar sniper rifle for 5 pts. A squad of 5 models may purchase a Venom as their dedicated transport. It may take vectored engines for 10 pts, star engines for 15 pts, and spirit stones for 10 pts. Wargear: Shuriken pistol, close combat weapon, flip belt, holo-suit (5+ invulnerable save), Eldar jetbike with twin-linked shuriken catapult. Special Rules: Dance of Death. Any model may replace its close combat weapon with a Harlequin's Kiss for 4 pts. Up to 2 models may replace their close combat weapon with a power weapon for 10 pts each. One in three models may replace the jetbike twin-linked shuriken catapult with a shrieker cannon for 10 pts. If the squad consists of at least 5 models, one may be upgraded to a Troupe Master for 10 pts. Wargear: Shuriken pistol, close combat weapon, flip belt, holo-suit (5+ invulnerable save), plasma grenades, shreiker cannon, suspensors. Special Rules: Dance of Death, Fleet of Foot, Relentless. He may replace the shrieker cannon with an Eldar missile launcher for 10 pts, a bright lance for 20 points, a star cannon for 15 pts or a scatter laser for 15 pts. He may take a domino field for 15 pts. May replace the shrieker cannon with an Eldar missile launcher for 10 pts, a bright lance for 20 pts, a star cannon for 15 pts or a scatter laser for 15 pts. The shuriken catapults can be upgraded to a shrieker cannon for 10 pts. It may take vectored engines for 5 pts, star engines for 15 pts, and spirit stones for 10 pts. Don't know if I'd bother with Mimes; just make Harlies Troops; it is their codex after all! I know they can get haywire grenades, but could probably stand some fusion pistol options. No harlequin wraithlord with d-cannon? I think that Mimes are an integral part of the Harlequin force, and they would be just as common as Harlequins surely. I have included the option to take Harlequins as troops when you take the Great Harlequin. Otherwise the Shadowseer would be the obvious choice. Maybe allow a single fusion pistol per unit? I guess otherwise with no significant AT they end up like Fire Warriors. When it comes to the wraithlord I'm torn. I don't want to be seen to encourage such an unfluffy construct, but I know that there are people out there already playing with them who might want to use my codex. Eternal Warrior might be inappropriate, perhaps FnP instead? And a Solitaire on a Jetbike? Other than this I think it looks remarkably balanced. Only thing I would do would be to change the Harlequins troops and the Mimes Elite, if you can find a copy of the very old red coverd Compendium it does imply that Mimes have a better holosuit than Harlequin. Hmm 18 first turn brightlance shots for 520 points is pretty fierce. You could fit that into a 750 point force! Didn't think enough about how spamming Death Jesters could abuse this apparently. I might change Death Without Warning to just apply to sniper rifles. Of course it needs playtesting to really know. I think the Solitaire needs Eternal Warrior to be viable as an unsupported behind the lines whirlwind. The jetbike option was supposed to preclude deep striking I think. He has to get to the battlefield somehow! My interpretation of the fluff is that Mimes are the chorus and the Harlequins play the more difficult roles. Mine _are_ harder to kill - in close combat. And as scouts they are the perfect unit to hold objectives in this army. Oh crap the fusion pistol option got left out of the Harlequin entry! Thanks for pointing that out sonsoftaurus. Fixing it now. Going back to the orginal fluff and army list I read, Mimes weren't really covered. I remember that they tend to play the more demanding Daemon roles andthe Master Mime tends to play the most demanding part of the Daemon, but yes the sniper role would fit them well. If I can borrow my mates copy of the old book I'll scan and email those pages to you if you want? The Harlequins are the Chorus from what I remember. Sure I'm seeing my mate tonight, I'll see if I can get the book. Also in the orginal codex the Shadow Seers came halucenogenic greandes, these have now been reintrodeuced in the Grey Knights codex, you might want to have a look at that as well. Also muffinman I am inclined to agree with your thoughts on the Webway option for the Solitaire.